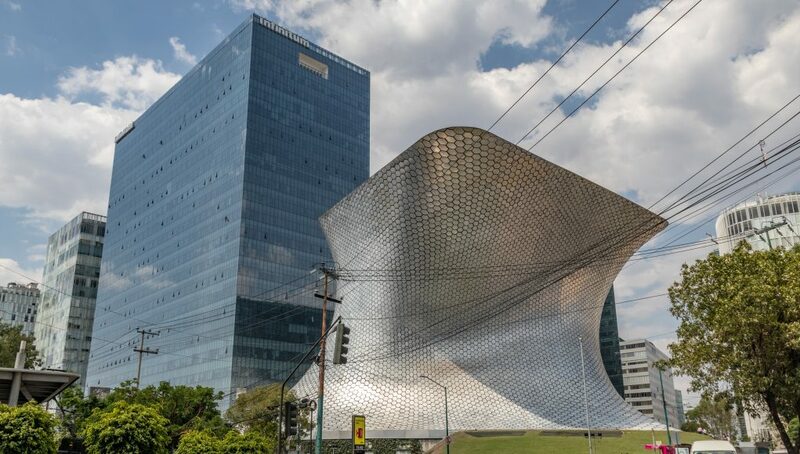 The Plaza Carso commercial district of Mexico City's Polanco district is dominated by the Museo Soumaya. Mexico City’s Museo Soumaya building at Plaza Carso is one of those buildings that I never get tired of looking at. The building is 151 feet tall with a skin of aluminum that changes appearance as you move around it. The aluminum tiles covering its unique shape reflect light and colors of the surroundings and the sky, providing a new color scheme minute-by-minute. The Museo Soumaya was built by and is owned by billionaire Mexican media mogul Carlos Slim. The name “Soumaya” was his late wife’s name. The building was designed by his architect son-in-law, Fernando Romero, and then engineered by legends Frank Gehry and Ove Arup. The building was inaugurated in 2011. Slim kept a lot of the business of constructing the museum in the family, using his own companies for various elements and stages of the construction. He used one of his companies that specializes in the construction of off-shore oil rigs to construct the building’s skeletal frame. Because of the unique anvil-like shape of the building, each of the museum’s six floors has a unique shape and unique connections to the rest of the building. The museum’s collection contains more than 60,000 pieces, including the largest collection of pieces by Auguste Rodin outside of France and the last mural painted by Diego Rivera. The glass-covered tower of the Plaza Carso shopping center provides two perspectives on the sky next to the Museo Soumaya. 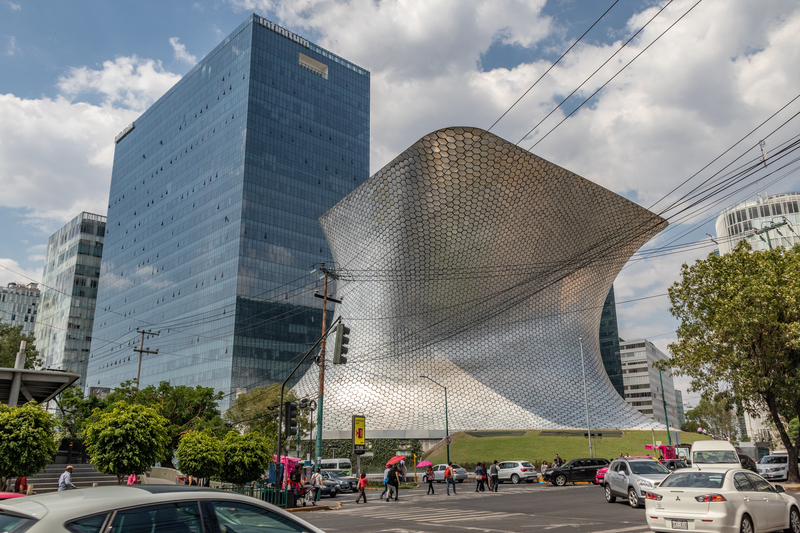 One section of Museo Soumaya frames other buildings in Mexico City’s Plaza Carso. The ramp up to the top floor of the Soumaya. The color of the Museo Soumaya changes depending on where you’re viewing it from and what’s going on in the sky and on the streets around it. An ideal artist’s loft, the top floor of the Soumaya is lit by the sun during the daytime. As you move around the Museo Soumaya, it’s hard to take your eyes off the building and its surroundings. Auguste Rodin’s “The Three Shades” on the top floor of the Soumaya. Next articleOn the streets of colonial Trinidad.